We had a great talk and a fantastic speaker at Moffitt today. 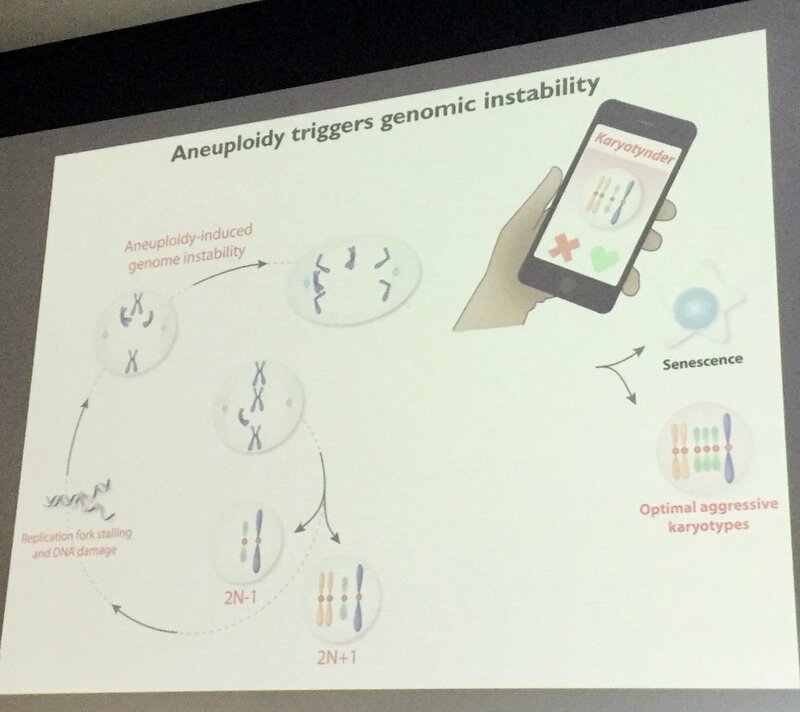 Angelika Amon, from MIT discussed aneuploidy and hypothesized that, while it represents a substantial fitness cost to the cancer cells that have it, it could allow for chromosomal instability, a better way to quickly increase a tumor's ability to find a genetic solution to an acute and immediate problem. For instance, in the case of treatment, aneuploidy-derived chromosomal instability will increase the odds of finding a clone that can escape such treatment. The point of this post is that we usually focus on mutations known as driver mutations, which are those that either allow the cells to proliferate faster or die less frequently. Given the importance of aneuploidy, one could argue that driver mutations would also include those that allow the tumor cells to better cope with the negative effects of aneuploidy. This is of course not entirely alien to those working on p53, which is implicated in DNA repair and which, when disabled, allows cells to proceed even in the presence for abnormal karyotypes. I do suggest though that mutations that allow cells to counter the toxic effect of having all these extra chromesomes and proteins that cannot bind to anything, will boost aneuplidic cells and thus increase the tumor's evolvability. PS: it looks like the posts are coming a lot more frequently than anticipated but I don't expect this to last.